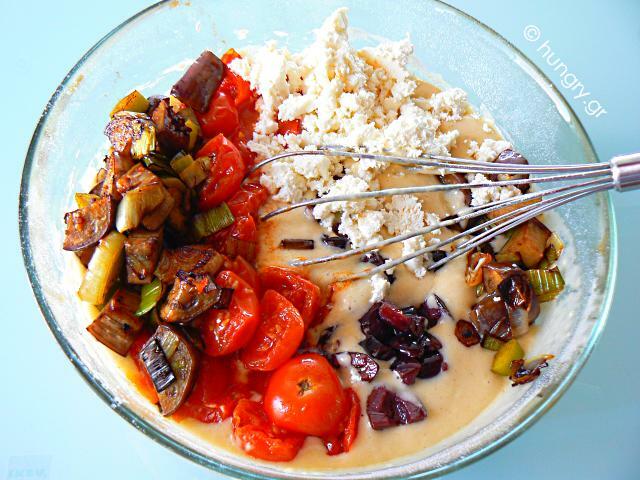 Eggplant, tomatoes, feta cheese, olives, and basil! Mixed in a fluffy batter and baked in the oven. 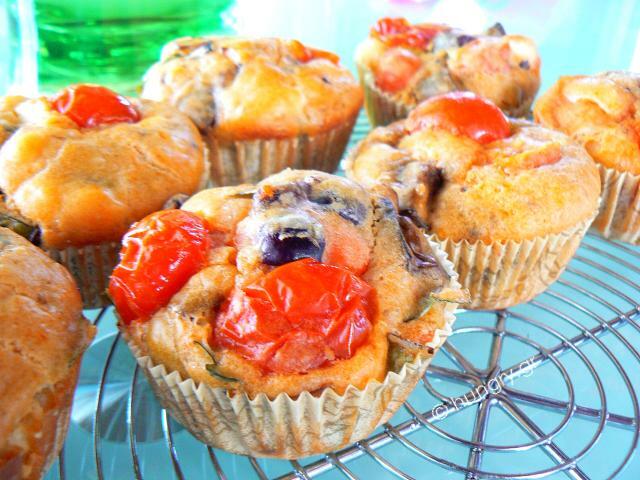 Savoury Muffins with all the flavor of Greeκ summer! Greece is known for its antiquities, geographical location, beautiful scenery, endless beaches and the blue sky. These are the main reasons that attract the visitors, plus one more. The delicious Greek cuisine! 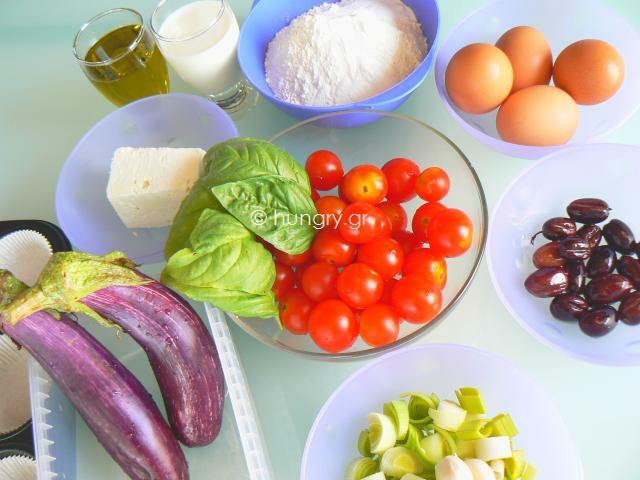 Most visitors love the Greek cusine and would like to cook the dishes tasted during their travels in the country. Today's appetizer includes the flavor of many typical products of the Greek flora and fauna. Fresh, delicious and simple materials. Try it! Put 2 tablespoons olive oil and sauté a few minutes to absorb the juices. Do not stir, nor turn. 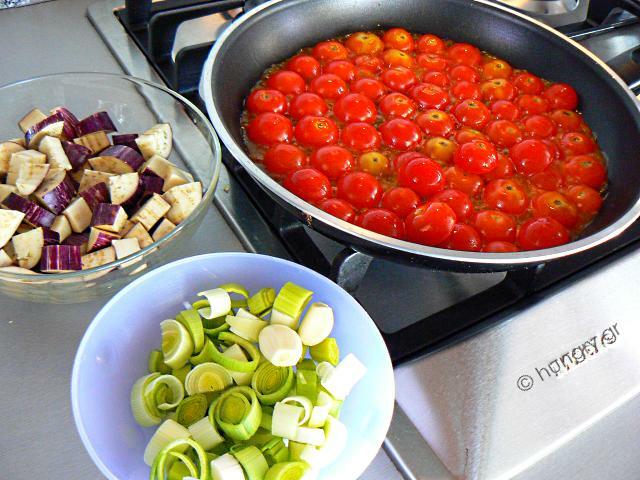 When ready remove carefully from the pan onto a plate and set aside for later. Wash and chop the leek into slices. Cut the ​​eggplants into bite size pieces. 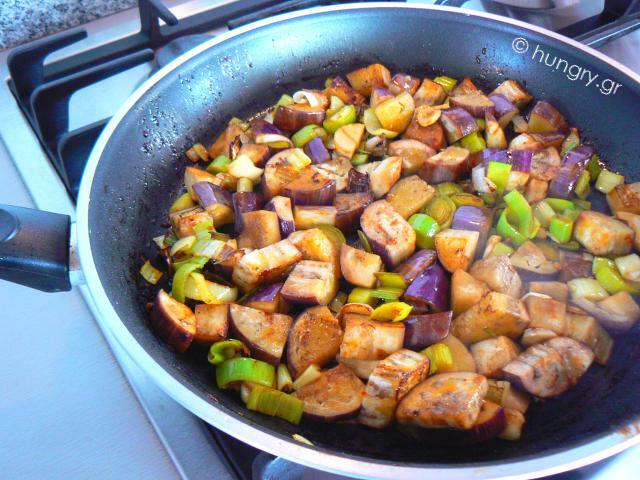 In the frying pan add 2 tablespoons olive oil and sauté gently the leek and eggplants for 3'-4'. Once they are ready, remove from the fire and put them on a plate and set aside for later. In a medium sized bowl mix the flour, baking powder, baking soda and turmeric. In another bowl, stir gently to mix: the remaining oil, the milk, and the eggs. 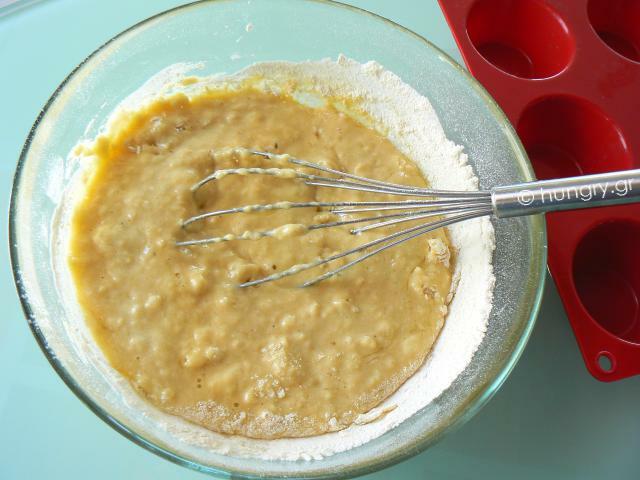 Mixing with the egg beater, start adding the flour mixture until fully mixed. 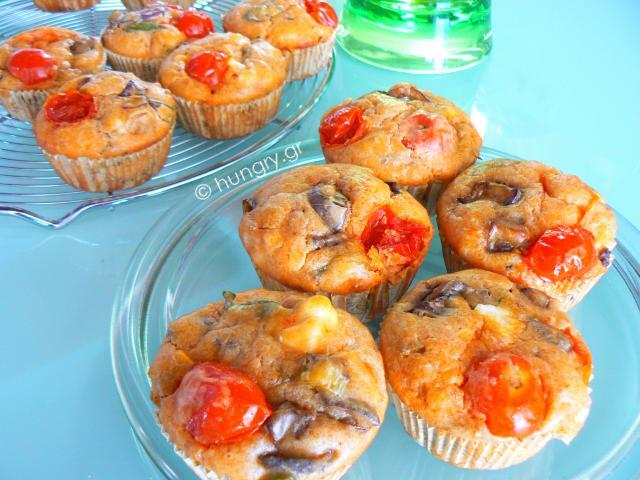 Keep some 15 halfs of the cherry tomatoes, to use as a cap / gasket of the muffins. Add to the batter the feta cheese, crumbled with a fork, the eggplants with the leek, olives, from which we removed the kernel, and then the remaining cherry tomatoes. Stir once or twice with a spoon. 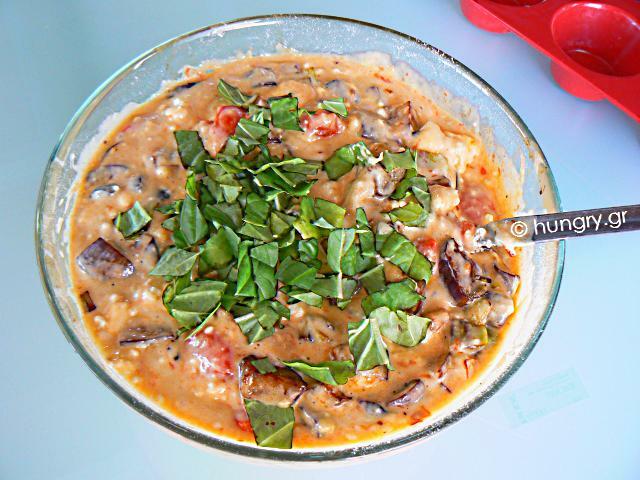 Finally, cut the basil into small pieces with scissors and add to the batter. 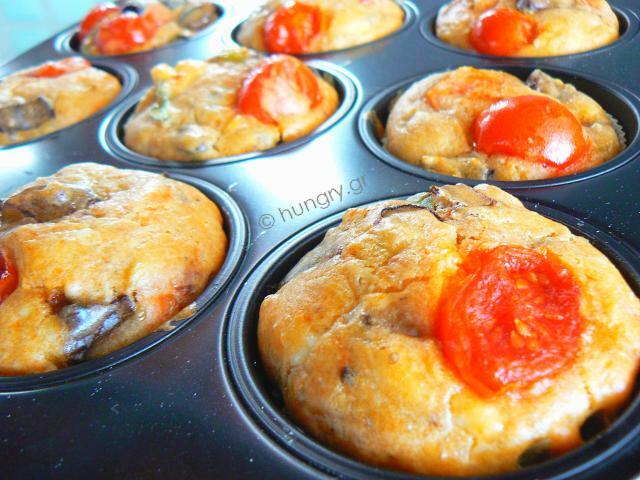 Put the paper bags in the muffin tin and put into them a large spoonful of the mixture. Bake in preheated oven at 180°C/ 350°F/ 4 Gas Mark for 30 minutes until they rise and are well baked. Let them cool on a rack and … try them. 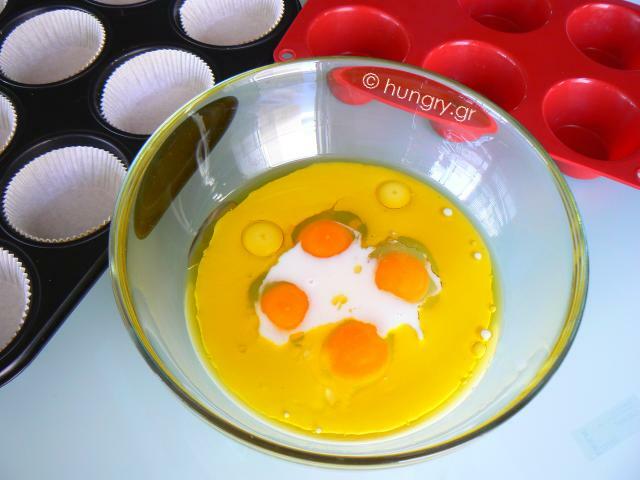 The ingredients are enough for 12 medium size and 6 small size muffins. 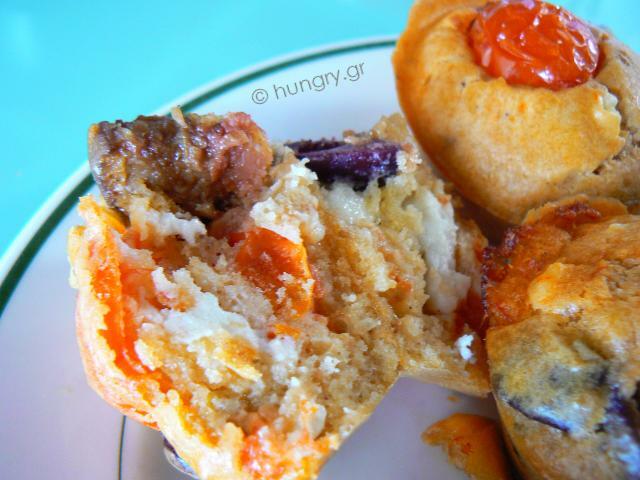 These muffins are delicious, with all the aroma of Greek summer kitchen, full of the flavors of eggplant, basil, olive and feta! Make them for a snack, that will accompany a refreshing drink, like beer, for summer evenings, with a pleasant friendly company!